The Heartless Bastards are perhaps one of today’s most underrated bands. After forming in Ohio back in 2003, the band signed to Fat Possum Records with a little help from The Black Keys’ Patrick Carney, released three albums to high acclaim, and toured with Wolfmother. Now they come rocking out on Arrow, produced by Jim Eno of Spoon. 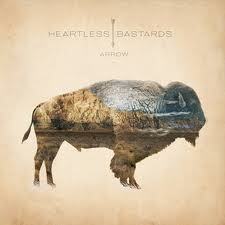 While it doesn’t have quite the rootsy feel of The Mountain from 2009, Arrow shows The Heartless Bastards completely owning their blues-rock sound. Frontwoman Erika Wennerstrom carries Arrow with her powerful, arresting voice. “Marathon” pulls you into the album with a gentle treble riff and muted waves of percussion clashing beneath her yearning vocals. It’s a rambling-road song in the best way, building into a big, crashing crescendo of guitars. “The Arrow and the Beast” continues the Americana with wailing steel guitars behind slow acoustic chords and darkly meandering bass, making you feel as if you’re in the middle of a Western movie, tumbleweeds rolling in the dust and cowboys about to start a shootout. “Only for You” and “The Arrow and the Beast” show off impressively crafted guitar solos from Wennestrom and guitarist Mark Nathan, managing to sound both meticulously melodious and effortless. Wennestrom’s vocals reach high and soar into a graceful soprano on “Only for You,” giving the song a delicate feeling. But she can rock hard too, as on “Got to Have Rock and Roll,” “Late in the Night,” and “Down in the Canyon,” yowling like a modern-day, female Robert Plant. “Skin and Bone” has a laid-back alt-country feel, with rich acoustic guitars and a catchy-pop chorus. “Low Low Low” also shows the band’s country and folk influences—its acoustic melody mirrors Wennerstrom’s deep, enchanting voice as she belts out lyrics aching with yearning for a home left behind, returning to the traveling theme of “Marathon.” And it seems the road is far from over for The Heartless Bastards. The band is still carrying on strong through its fourth album, far from its beginnings in Ohio, with a long way yet to go.